Unfortunately, at the August 2018 Queensland Labor conference, their members have once again voted to condemn Israel and call on the immediate recognition of a Palestinian State. The spokesman for the Queensland Jewish Board of Deputies, the roof body of Queensland Jewry, Jason Steinberg said the vote was very unfortunate. “There are some elements of the Queensland ALP, led by Wendy Turner, that do not understand the well established requirements for statehood stipulated by international law,” Jason said. Despite the motion passing, there where members of the Labor Party that argued against it during the debate. “It was good to hear there was vocal opposition from the floor, most notably from the Member for Logan, Linus Power,” Jason said. “Mr Power warned against any form of recognition that was not conditional on ‘Palestine’ respecting independent trade unions, women’s rights, LGBTI rights and the rights for minority groups. The QJBD calls on all Labor members throughout Queensland and Australia to seek more information about the topic. Read here an article by the ECAJ’s Peter Wertheim on the topic. Queensland’s Jewish community has taken delivery of five new life saving CardiacScience G5 defibrillators for use at its synagogues and Brisbane’s Gan Gani Kindergarten, thanks to the generosity of the Pelerman Foundation and coordination by the Queensland Jewish Board of Deputies (QJBD) and welfare body JCareQld. “The first 10 minutes can be the difference between surviving a major cardiac event and not, so now we have a defibrillator at hand we can be prepared,” Professor Abramson said.The project to install the defibrillators was initiated by Professor David Abramson, from the South Brisbane Hebrew Congregation, who said the units would be invaluable if there was an incident at one of the community’s key venues. In addition to generous support from the Pelerman Foundation, received through welfare organisation JCareQld, each organisation matched the funding to cover the costs of the units. 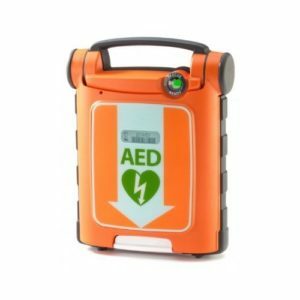 Organisations that now have new defibrillators include Gan Gani Kindergarten, Brisbane Chevra Kadisha, Temple Shalom Gold Coast, South Brisbane Hebrew Congregation and the Gold Coast Hebrew Congregation. QJBD President, Paul Myers, gratefully acknowledged those organisations that accepted the opportunity to purchase a defibrillator and thanked Real First Aid who provided a significant discount. 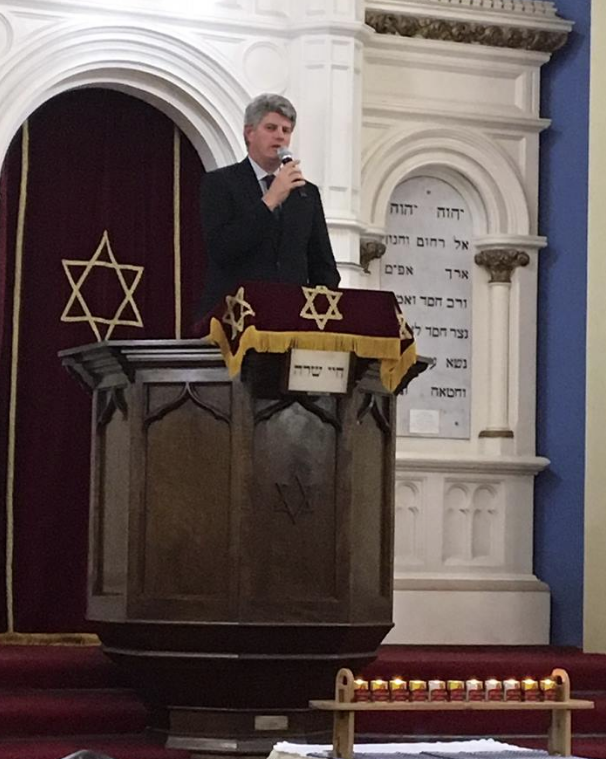 “This is a great example of how the Jewish community in South East Queensland can work together towards a common goal,” Myers said. The defibrillator units can be used by anyone, regardless of training. The unit gives clear instructions on what to do, and only delivers a shock if required. QJBD Vice-President Jason Steinberg shares his deep concern over this week’s demonstration, which featured the burning of an Israeli flag. Today (20 December) the Courier-Mail published his article on-line, for subscribers only. We have republished it below. ON Saturday night in Brisbane there was a protest. People marched through the streets of the CBD under the protective guidance of the Queensland Police. Our great democratic society gives everyone this privilege, even if their messages are filled with hate. 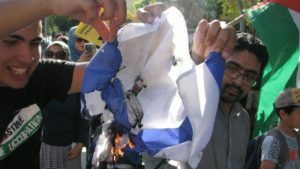 These kinds of demonstrations happen often, but what was unique about this protest was the deliberate and disgraceful ceremonial burning of an Israeli flag. What hatred. What an extreme and racist act. What a disgrace. What an attack on Queensland’s multicultural values. The protesters were apparently marching in condemnation of Israel in retaliation for the United States government undertaking to deliver the long-held bipartisan commitment to move the US Embassy to Jerusalem and recognise that city as Israel’s capital. For this reason, men, women and children shouted slogans demanding “liberation”, “from the [Jordan] river to the [Mediterranean] sea”, which includes not only the West Bank and Gaza Strip the Palestinians claim for a future state, but the whole of Israel’s legally recognised borders. In other words, the chant is an explicit call for the destruction of Israel, the world’s only Jewish state, and the subsequent genocide of 6.4 million Jews living there. I’ve lived in Brisbane all my life and grown up as a proud Queenslander, proud Australian and proud member of the Jewish community. Our community has, for more than 150 years, actively contributed to the fabric of Queensland society. To have the burning of the Israeli flag on our peaceful streets sent a shiver down my spine and many other members of our community. What’s next after burning flags? Targeting Israelis? Targeting Jews? Jumbled up with the anti-Israel hatred is anti-western hatred. Protesters must have missed that in April the Russian government issued a statement saying “we view West Jerusalem as the capital of Israel”. This attracted no controversy, no flag burning and almost no comment. Those who deny the Jewish connection to Jerusalem seek to airbrush 3000 years of history attested to by innumerable archaeological artifacts. Jerusalem has been the centre of the Jewish world since 1010 BCE when King David made it the capital of the Jewish kingdom. David’s son, Solomon built the first of two Jewish temples there in the 10th century BCE. It was not until the beginning of the 7th century CE, some 1650 years later, that an Islamic structure was built atop the ruins of the Jewish temple. Throughout history, Jerusalem has been ruled by one foreign power or another, including the Babylonians, Persians, Greeks, Romans, Muslims, Crusaders, Ottomans and the British. The only times when Jerusalem has been under local rule has been when it has been the capital of a Jewish State – ancient Judah/Judea and modern Israel. Today, Jerusalem is like Canberra – it’s where the Israel’s parliament is located, its Ministerial offices, the Supreme Court, and the Prime Minister’s residence. Recognition that Jerusalem is the capital of Israel is therefore a pragmatic acknowledgement of an existing reality. Another moment in history the protesters fail to acknowledge is that in July 1922, the League of Nations (the forerunner to the United Nations) entrusted Great Britain with the Mandate for Palestine which legally, under international law, recognised “the historical connection of the Jewish people with Palestine”. 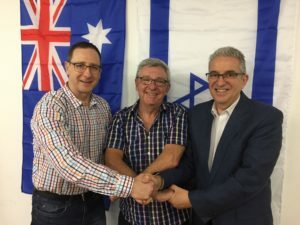 Queensland’s Jewish community wants peace between Israel and the Palestinians. We, like all Jewish-Australians, want an enduring, workable and realistic solution, based on the right of Israel to live in peace within secure borders, and reflecting the legitimate aspirations of the Palestinian people to also live in peace and security. The act of burning the flag of a sovereign state, and key ally of Australia, is not intended to support peace. It is an act of hatred and not in keeping with Queensland’s multicultural values. While such violent images have become familiar sights on the streets of Arab capitals, they have no place on the streets of Brisbane. Jason Steinberg is the vice-president of the Queensland Jewish Board of Deputies. After eight years as president of the Queensland Jewish Board of Deputies, Jason Steinberg, has handed the reins to long-time communal member, Paul Myers, at the organisation’s annual general meeting in Brisbane this week. Steinberg, who has been involved with the board in various capacities since the early 1990s has been voted in as Vice President. He said he was very happy to be handing over to Mr Myers, who is a former Maccabi Queensland President, to lead the communal roof-body that represents more than 4500 Jewish people. “Paul is a well respected member of the community, a true Queenslander and a great person who will bring a range of skills to the role, including a strong consultative approach,” Jason said. remembrance and ensuring relevant organisations established child protection policies. “It’s also been the initiatives and activities behind the scenes that have helped our community along the way to grow, resolve issues and remain safe which make me most proud. Mr Myers said he was looking forward to the years ahead as president and the opportunities the QJBD has in leading a small community that has population in Brisbane, the Gold Coast, Sunshine Coast and far north Queensland. “Next year will be our 70th anniversary, just as it will be the State of Israel’s, and we have a great opportunity to continue to support our affiliated organisations grow,” Paul said. 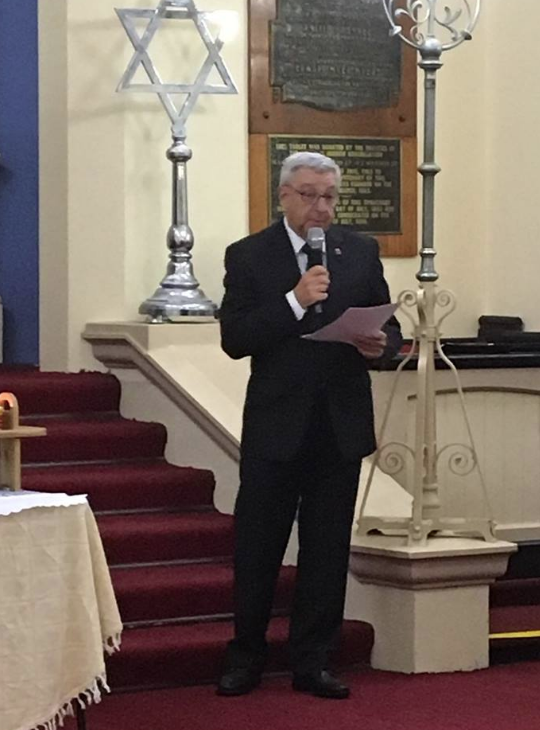 Mr Paratz said he was honoured to be given the position and was pleased to be able to continue to assist the QJBD in it’s role to provide united representation for the benefit of the whole of the Jewish Community of Queensland. Mr Paratz joins a former long-serving President of the QJBD Laurie Rosenblum, OAM, with the Life Governor honour.